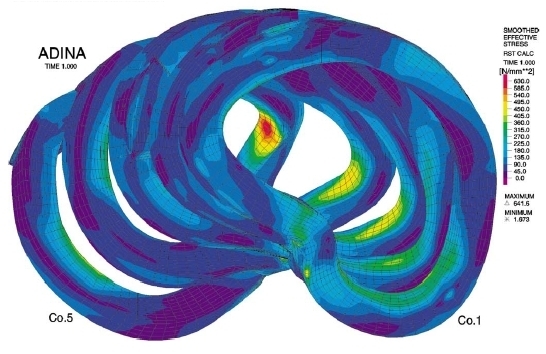 In this News, we present the nonlinear finite element analysis of a major component of the world's largest plasma fusion experimental device called Wendelstein 7-X (W7-X) , using ADINA. 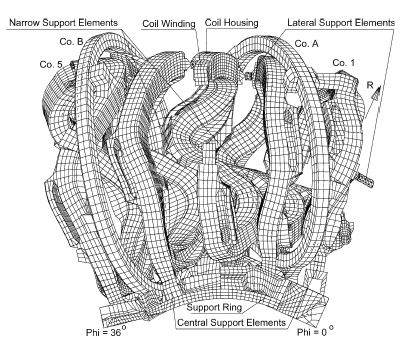 The component considered is the support structure of the super-conducting coils. The analysis, design and fabrication of the device are undertaken by the Max Planck Institute for Plasma Physics, Garching, Germany. The results of these analyses are reported in several publications, e.g. [2,3]. 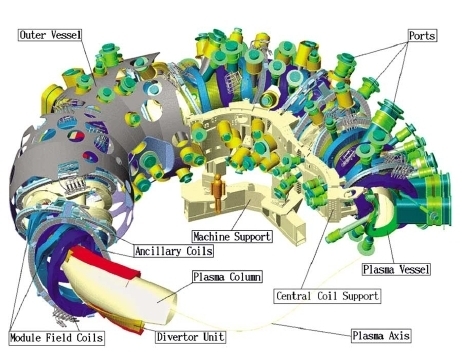 Figure 1 shows the plasma fusion device and its supporting structure. Figure 2 depicts the finite element model of the structure. For solution of some load cases, the FE model is reduced to 1/10th of the whole system by taking advantage of the symmetry of the structure and loading, and by introducing special boundary conditions using the constraint equation capability in ADINA . Figure 3 shows the representative periodic component used in such analysis. This model consists of 38,000 eight-node solid elements, 24,000 eight-node shell elements, 12,000 gap elements and 40 contact surfaces. The gap elements and contact surfaces are the sources of nonlinearity in the model. 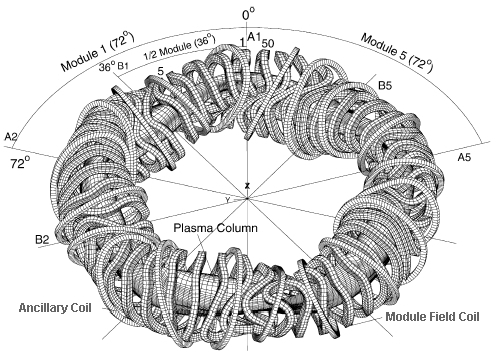 The model is loaded by electromagnetic forces caused by the electric current in the plasma fusion coils. A contour plot of the displacement field in the model is presented in Figure 4. The dashed lines represent the undeformed shape of the structure. Figure 5 shows the effective (von Mises) stress in the structure. Plasma fusion, nuclear reactor, electromagnetic forces, constraint equations, contact, gap element, nonlinear finite element, ADINA. 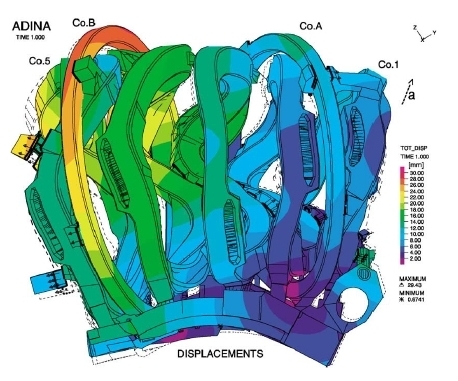 N. Jaksic and J. Simon-Weidner, Design analysis of the support structure stressed by large superconducting coils for a plasma fusion experiment, Computers and Structures, 81 (2003) 697-714. V. Bykov, F. Schauer, K. Egorov, P. van Eeten, C. Damiani, A. Dübner, M. Sochor, L. Sonnerup, A. Capriccioli, A. Tereshchenko, N. Jaksic, W. Dänner, M. Rumyancev and D. Zacharias, Structural analysis of W7-X: Main results and critical issues, Fusion Engineering and Design, 82 (2007) 1538-1548.